This sourdough bread, generous with the fresh rosemary, has a light tender crumb and golden crisp crust topped with a sprinkling of coarse salt. The revival of this beautiful recipe is connected with the name Luciano Pancaldo, a baker from the town in the north of Italy, Ferrara. Reading the biographical materials about D'Este family, the rulers of Ferrara at that time, Luciano Pancaldo came across the description of the bread, which was baked for the Dukes. The bread, which was full of rosemary aroma, had a light crumb and golden crust decorated with salt crystals shimmering like diamonds. Being very inspired by the description he decided to create the recipe for Panmarino. To prepare the first preferment, mix all the ingredients in a bowl. Cover and leave it at room temperature for 10-12 hours. To prepare the second preferment, add flour and water to the starter of first build. Mix well. Cover and leave it at room temperature for 10-12 hours. Dissolve the preferment with water, milk and malt extract in the mixing bowl of your stand mixer. Set aside for 10 minutes while preparing other ingredients. Add the flour to the liquid mixture. Mix all to form a dough. Allow it to sit for 20-30 minutes. Stir in the salt, olive oil and chopped rosemary into the dough and knead until the gluten develops. Turn out the dough and shape into a ball. Grease the mixing bowl with a bit of olive oil and return the dough to the bowl. Put it inside a plastic bag and leave it in the fridge overnight. 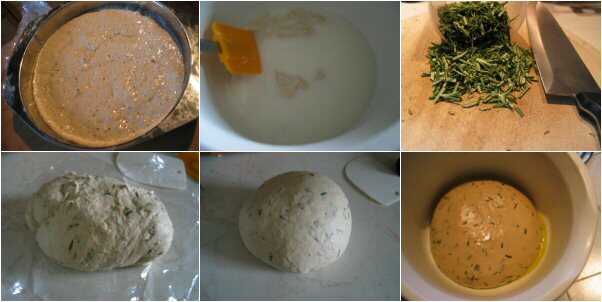 In the morning (about 6am) of day 3, take out the dough and fold it once and return it to the fridge. In the late afternoon (about 5pm) of day 3, take out the dough and let it warm to room temperature over the next 4-5 hours as you gently stretch and fold it. I just folded it once every hour for five hours and kept it from drying out by putting it inside the plastic bag in-between folds. The dough should be velvety smooth, moist and blistered by the time it is ready for shaping. Divide the dough into two portions and shape. 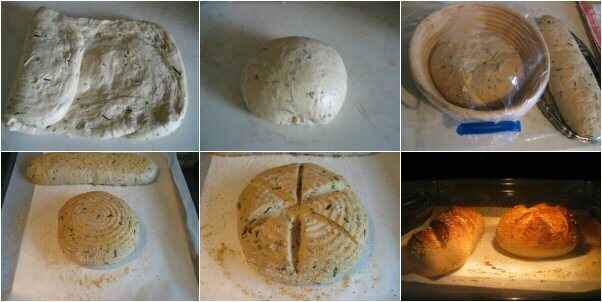 I shaped one portion into a boule and one into a baton. Place the boule in a round bread basket dusted with semolina and the baton in a tray dusted with homemade soya meal. You can use the flour or semolina instead. Place each inside a plastic bag and let rise for an hour or so before putting them in the fridge for baking in the morning. Be sure to cover the dough in the fridge so it does not dry out too much. In the morning (about 8am) of day 4, heat the oven to 250C/500F. Invert the boule onto a baking paper-lined baking tray together with baton. Just before putting the bread into the hot oven, slash the tops in an asterisk with a sharp knife or a razor blade. Sprinkle some sea salt into the cuts. Place the baking tray with bread in the oven and throw a handful of ice cubes into the bottom of the oven. Close the oven door and bake for 10 minutes at 250C/500F. If you are using a fan-forced oven, then turn the oven off for 10 minutes or the fan would blow all the stem away. Now set the oven temperature at 210C/410F and bake for 30 minutes longer until nicely golden brown and crusty. Remove the bread and allow them to cool on a wire rack to room temperature before cutting. I am sending this to the "Bake Your Own Bread-April" at Girlichef. Just so nicely and neatly executed! Think I need an alarm clock with me : ). Well, is it 5pm of day 3? I loved your bread,and your photos too...!!! !i will make it for sure!!! !Hello from Greece!!! Angie, you are absolutely an artisan baker! Love rosemary bread dipped in olive oil and balsamic. Gorgeous loaves of bread! The crust is perfect. beautiful bread, must be full of rosemary aromatic.. Your bread looks really good ! By the way... do you knead by hand or stand mixer ?! What do you use if it's stand mixer ? What a beautiful rustic bread ! I'm planning to make some bread soon , I hope it will turn out good hahahaha Gorgeous photos as always , Angie ! Angie, I would love to spend a day in your kitchen with you. Angie, this bread looks so good, rustic and well executed! I've never heard about Luciano Pancaldo, but I'm so curious to give this recipe a try! Just love the smell of fresh rosemary! Gorgeous loaf. @TasteHongKong ;-) yes..I just corrected it. Thanks! I've said this before, you are certainly an accomplished bread maker Angie. Sply beautiful. Such dedication too, I would have run out of patients after the first 10 hours! You've created a beautiful masterpiece Angie. We love sourdough and rosemary, one of my favorite herbs, would only make it better. I really don't think I've ever seen a more gorgeous loaf than this! These do look very professional, right out of a bakery. Love the crispy crust as well as the fluffy interior. Italian breads are some of the best around. This recipe is definitely a keeper. Stunning photos as usual. Have a great day! 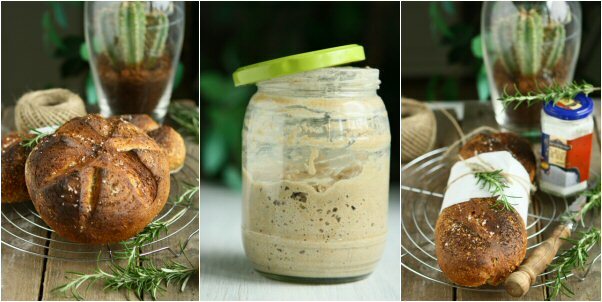 I love infusing bread with rosemary. I don't bake bread enough - just a few times in the winter. My loss. These are incredible! wow execellent nice made...perfect bake. Beautiful bread Angie - you are the master! I can almost smell the rosemary and taste the tiny bit of salt on the crust. Yum! Loving the meticulous instructions given here, Angie! You've made a seemingly daunting recipe seem very approachable. I love a good rosemary bread--I'm intrigued by the addition of the malt extract and the extra flavor it must impart. Looks delicious! Great photos! The bread looks PERFECT! Just classic. Is there anything better than a loaf of rosemary bread? I think not! Thank you for sharing. I hope you are having a good Wednesday, and I hope the end of the week is even better. Your breads are gorgeous, and perfect, as always Angie! I sure would love for your to send me that jar of starter, and I can get started on my own breads...got plenty of fresh rosemary! I wish you had a bakery here ! Beautiful bread!!! I have never tried making a 'starter' and am intimidated to say the least. How I would love having the end result of your bread, though. I must try! I love making bread. Love rosemary. Love your presentation. Super flavourful bread, looks marvellous.. This look like the perfect loaf! I love the rosemary in there! @Anonymous I used the mixer. You bake some of the most gorgeous loaves! This must be so tasty dipped into soup. Beautiful bread! Actually it looks like the perfect loaf! What a beautiful Italian bread, Angie! You are such a talented baker and equally talented behind your camera lens. Lovely post and recipe. Thanks for sharing! I'm going to try some of recipes for sure, and I'm going to share them with my friends. 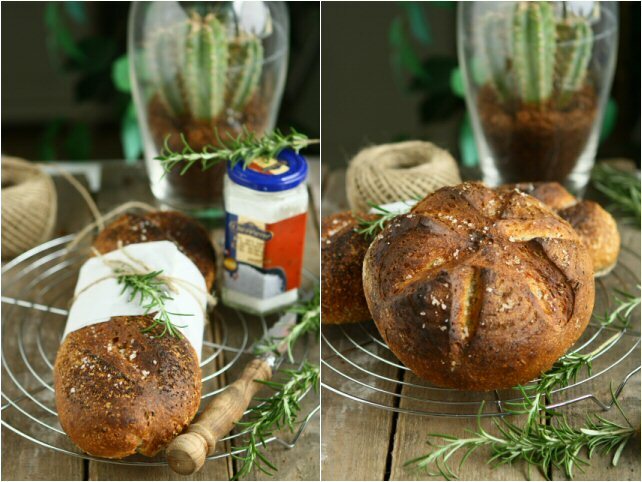 I bet the rosemary left a very fragrant touch in this bread!Looks delicious! The bread looks amazing!!!! I wish I could make bread that looked this good. YUM! Oh, yum. Yum yum yum! These loaves are gorgeous! I can just close my eyes and smell that rosemary... Love those cuts on the top; so rustic and charming. Dear Angie I love make bread and yours look amazing!! incredible loaves!! angie, i also get inspired looking at all of your posts here! Stunning pictures! You're such a fabulous baker Angie! I love rosemary bread! Gorgeous bread, Angie!!! Congrats on your Top 9!!! looks amazing! looks like a william sonoma photo shoot! Angie, your bread is fantastic! Pictures make it look very tempting. I wanted to ask how are you able to so precisely measure the ingredients (for example, 94 g flour, 56 g starter)? Do you use a chemical scale for that? Is it necessary to be that accurate with measurements with rustic bread like this? I adore the perfume of rosmarine!I have to try this delicious recipe!Hugs from Greece,dear! This bread looks just perfect, I don't know how I missed it. I am still working on getting mine to look like yours. Great job and I love the photos. This bread looks gorgeous but I just never have the patience to make sourdough. Beautiful story and also the bread! I love the rosemary scent in the bread. I absolutely adore sourdough bread and rosemary. I think it is such a great combination. Next time, I'm adding salt on top. Yum! The scale I use is a standard digital kitchen scale, which can weight anything from 1gram to 5kg. I think when it comes to making artisan bread, it's rather important that your measurements are accurate. While preheating the oven, I took the dough from the fridge, invert onto the baking sheet...etc. and when the oven is ready, I put them in the oven. So I didn't really give the dough time to rise at room temperature on purpose. And since they sat in the fridge the whole night and rose beautifully, there's no reason for me to let them rise again at the room temperature. However, you can try to proof them at the room temperature for an hour before putting them in the fridge for the night. This is so impressive. You truly are a gifted baker. What an amazing job. I love the step by step pictures. Love this post! I see why this was Top 9, congrats. I will devour any kind of bread, but sourdough is my absolute favorite. Are you sure you aren't interested in relocating to Cali and being my neighbor. Hope you have a wonderful weekend. What a wonderful crust and texture for this aromatic bread, Angie..lovely! So cute n yummy bread, looks so tempting. I love rosemary in bread. It gives such a wonderful flavour. Your bread hit the right spot...love the flavour of rosemary. My favourite topping for focaccia is rosemary, oil and garlic. Gorgeous loaves! Love how you wrapped them. Angie, this is just stunning!! I love the whole package look and all, lock, stock and barrel! I wish I could bake like that! So crusty and delicious Angie! I wish I had half your talents for baking! I love the story behind it too! Beautiful bread, Angie! Makes me want to go into the kitchen and bake. Such a gorgeous rustic bread…makes me want to go make some! Your presentation is beautiful! It looks amazing Angie! weekend workshop! In the past, I had made note of your tutorial of making this wonderful starter. Unfortunately, I'm guilty of not having made enough efforts in the bread making department. This bread is delish especially with lemon butter and freshly ground black pepper!